This is Part 3 of a three part quilled jewelry series. Each pattern is designed for the person who is brand new to the craft. The first two designs can be found here and here. All are for personal use only. 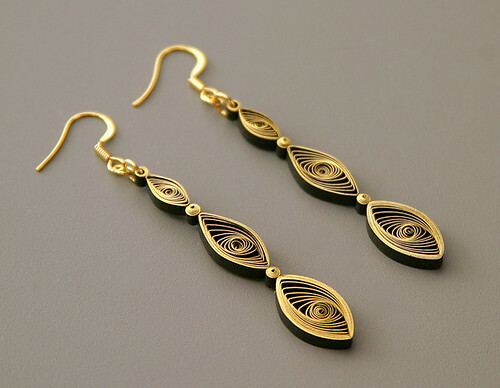 If you like to give handmade presents, here's an idea... make stylish drop earrings from gilded-edge quilling paper. Your girlfriends will be thrilled at how lightweight and comfortable they are to wear, not to mention surprisingly durable; they'll even survive New Year's Eve and beyond! Quilling isn't nearly as complicated as you might think... after a bit of practice it becomes very relaxing to do, just like knitting or crocheting. Another nice thing is that the supply list is short - you probably have most everything on hand with the added bonus that a basic quilling tool and paper strips are inexpensive. Gold-edged strips, even though they look rich and oh-so-shiny are just $5.00/package; many pairs of earrings can be made from one purchase. Silver and copper-edged strips are available too. I ordered my favorite precision slotted tool (blue one in the supplies photo) from Japan, but it isn't a necessity. 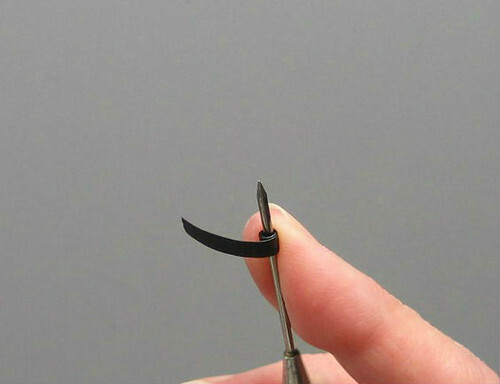 A slotted tool, available in craft stores and from any online quilling supplier, costs just a few dollars. 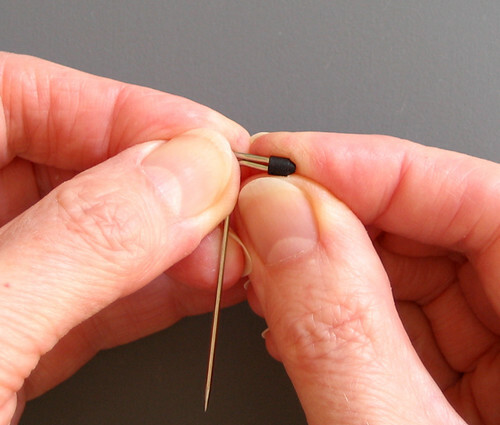 If you prefer your coils to not have a center crimp, use a needle tool (wooden handle in photo) or substitute a stiff wire, tapestry needle, or corsage pin. Enough chit-chat, let's get on with the how-to! 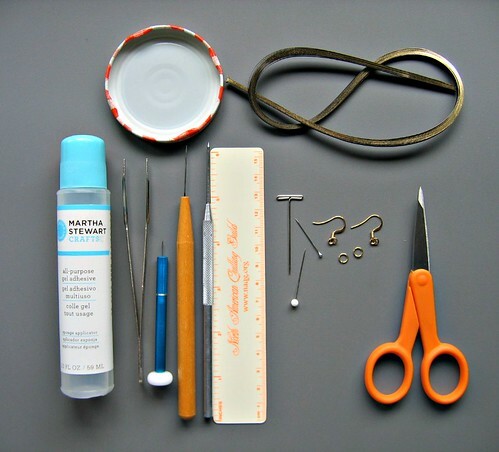 Glue - I like Martha Stewart Crafts Gel Adhesive and Scotch Clear Glue but any craft glue will do. Aleene's Tacky Glue is another good one. Non-stick surface - use as glue palette and work board. An acrylic sheet, waxed paper, or Styrofoam tray are fine too; I often use a jar lid. Damp cloth - sticky-glue fingers and quilling don't mix! 1. Make a ring coil: Roll a 2 inch strip on a paper piercing tool or cocktail stick. Glue end and slide coil off tool. (make 2) A jump ring will need to slide through the ring coil so be sure the opening is large enough to accommodate one. 2. 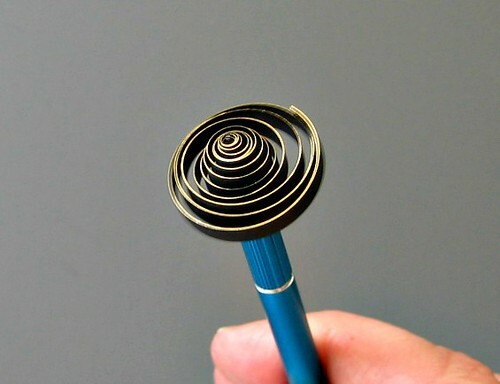 Make a domed tight coil: Roll a 2 inch strip on quilling tool of choice. Glue end in place without allowing strip to loosen. Slide coil off tool. Press against one side of coil with a T-pin or ball head pin to create a dome. Note: for ring coils and tight coils, work with strips that have a torn end. 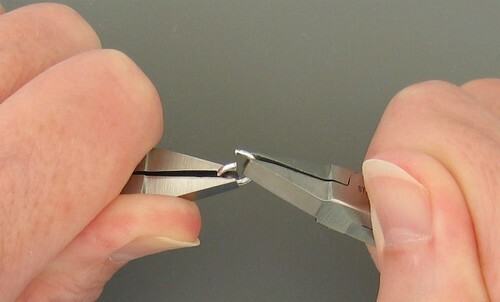 A torn end will glue more smoothly than a sharp cut and the coil will appear perfectly round. To make a marquise coil: Roll strip on tool and allow it to relax. 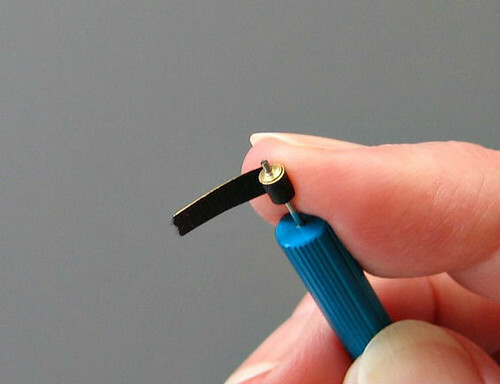 Slip this loose coil off tool and compress it between thumb and index finger. Note: Use a straight pin to evenly space the inner coils if necessary. Pinch a sharp point at each end. Glue end in place and trim excess paper. 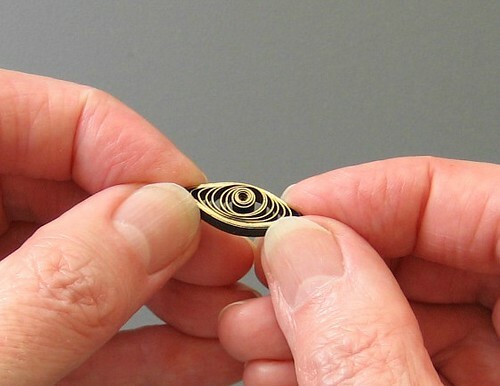 Hold coil at points and gently compress them toward one another all the way to the center. When the coil is released, the inner coils will spin around and create what Licia Politis has named a vortex coil - a good way to think of it! The vortex shows best in a densely quilled coil with lots of rotating spirals, so don't skimp on the length of the strip. 4. 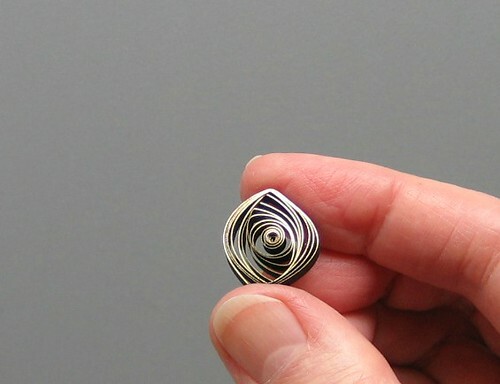 Assemble components: Glue coils together to make earrings as shown. Allow glue to dry for a few minutes, turn earrings over, and apply reinforcing dots of glue to all join spots with the tip of a pin. 5. The next day, slide an opened jump ring through each ring coil and slip on an earring wire. 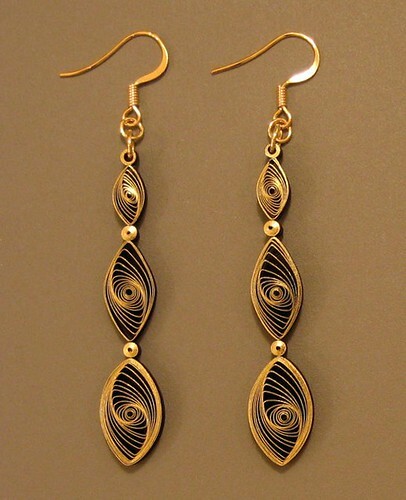 Close jump ring, wear, and receive compliments - no one will believe your golden earrings are made of paper! The finished earrings are about 2 inches in length, not including the hardware. You'll need far less glue than you expect. 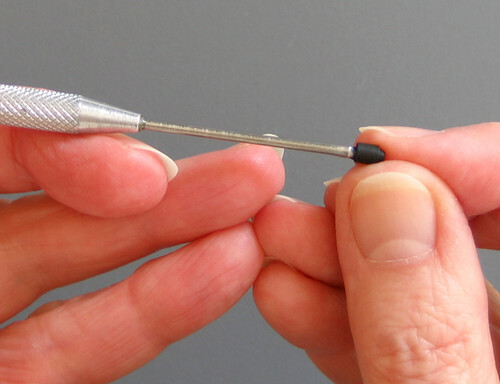 When adhering coils to one another, apply glue sparingly with the tip of a pin, paper piercer, or use a fine-tip glue bottle available from quilling suppliers. I don't apply a fixative to my necklace pendants and earrings as they don't receive a lot of hard use, but if you live in a high humidity area, you might want to apply a spray or brush-on fixative. In lieu of ordering gilded-edge paper, try adding your own metallic shine with a Krylon leafing pen or even a metallic gel pen. 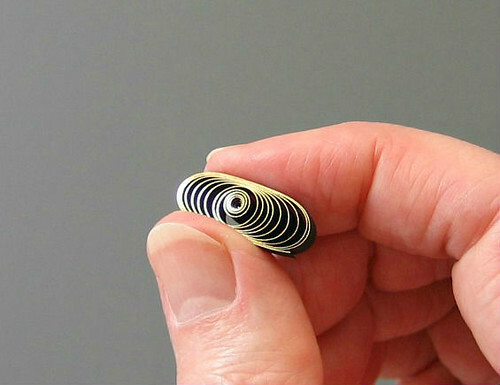 You might also press a silver, gold, or copper ink pad against rolled coils for a gilded effect. 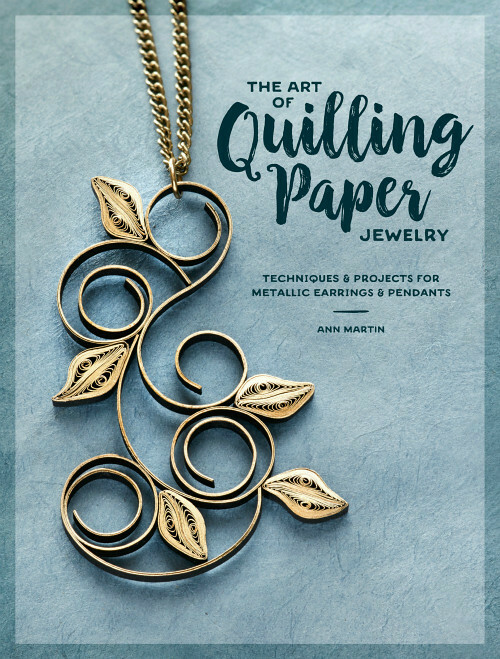 You'll find many more of my quilled jewelry patterns in my book The Art of Quilling Paper Jewelry. Perhaps add it to your wish list or ask your local library to place an order if they don't already have it on the shelf. Beautiful ! Thanks for the detailed tutorial. love these!!! great instructions w/ photos..also love the "vortex coil" can't wait to make a pair..well done, thank you. Looks like real old gold! These are so pretty! I must try them. Love all the details you share in your tutorials. Makes it looks easy. Really nice..Thanks for this learning's..
soo elegant n beautiful.. Thanks for the tutorial.. So perfect and such a simple elegant design. I observe you never use a circle sizer to get even coils. I find it hard to without using one. Thanks everyone! Allow me to give much of the credit to the gilded paper. It's really beautiful stuff and no, I don't own stock in the company. :) Suganthi, it's funny... I learned to quill without a circle board so have never felt the need to use one. I think it's all in what you get used to. Wow, wish I was 'cool' enough to wear these. They're fabulous! 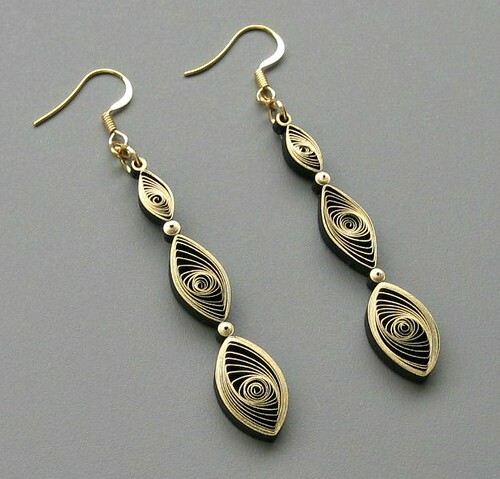 beautiful ear-rings and and very good tutorial. Its really pretty. I will try this. Hope i get those coils in India. Instead of glueing them 2gether I used wire that de dangle. But still so elegant!! Thanks everyone, I'm so glad lots of you are making them! You're welcome, Debbie. I hope you'll make 'em! Hi, After Making my Quilled Jewellery the Eye pins, Head pins, Jump rings are Discoloring with in a week eventhough I have packed it well in a box...Can u plz suggest me How to solve this problem..
Madhavi, are you using sterling silver? If so, try putting the jewelry piece in a small ziplock plastic bag inside the box. Exposure to air tarnishes silver and I find it tarnishes even more quickly inside a small paperboard box. I have to wonder if there is acid in the paperboard or cotton batting that reacts with silver. Thanks For Your Reply...Iam facing the problem only with related to Gold color Coated Eyepins, Head pins, Hooks etc..Iam Applying Some shiner and Asian paint varnish for Waterproof and for Glossy Look.. I have noticed gold colored jump rings sometimes lose their shine. Rubbing on silver polish (even toothpaste!) makes them shiny again, so it's probably the same oxidation process as with silver. 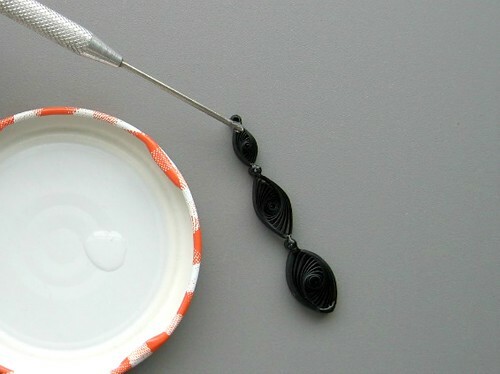 It's difficult to polish quilled jewelry once it is assembled though. Probably the best thing to do is to keep it in a small plastic bag when not being worn.